It is impossible to mention the Greyhound without also mentioning coursing and the racetrack. This breed excels at coursing and many owners enjoy competing in the sport, however the professional racetrack does have its darker side. When the dogs become too old to race they are often euthanized. Unfortunately, most finish racing within the first two to five years of their lives. Recently, many groups have been formed to stop these deaths. In years past around 20,000 Greyhounds were killed per year in the United States alone. Now, through adoption programs, that number has been reduced, although exact count is disputed, it is estimated to be between 12,000 to 2,000 Greyhounds are still killed annually. 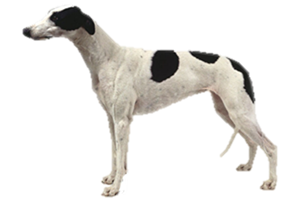 The Greyhound may have one of the most disputed history’s in the dog breed world. Ancient artwork dating back more than 6,000 years depicts similar sighthounds in Egypt and the Middle East. It is unknown when or how they arrived in England, although it is likely that their ancestors were transported by the Phoenicians. Their name is as obscure as their history and there are fierce agreements on where it came from. Some have suggested it was originally Grewhound, ’grew’ meaning ’Greek’. Another guess ties it to the Saxon word ’grei’ meaning ’beautiful’. Once in England these dogs were refined and used for hunting deer and wild boar, able to reach speeds up to 40 MPH, it was able to catch prey and pull them down without stopping. They were prized by nobility and serfs were forbidden to keep them. Freeman were allowed to own them, but if they lived within 10 miles of the royal forests their dogs were deliberately maimed to prevent poaching. As the forests and prey declined Greyhounds began to be used for racing. The invention of the racetrack brought gambling to the sport and early dogs were even provided with ’jockeys’, that is, they had monkeys strapped to their backs. Is the Greyhound Right for You?